As I write this diary it is a beautiful sunny day, albeit with a cold wind. On the whole, it has been a wet winter and very windy on occasions. The wind has taken off some slates from our farm buildings and we are just waiting for this to be repaired. The good news is that we have started calving! 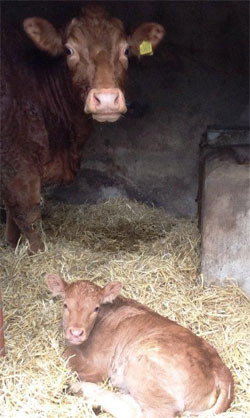 The first calf was born on the 12th February (a very small little heifer calf – I think she was bit early). Since that time we have had 14 calves born with the tally being 7 bulls calves and 7 heifer calves. Now our herd is at the number of cows we can house and calve-down we would prefer bull calves mostly, but we are grateful that everything so far is alive and born without incident. We have another 8 to calve including 3 maiden heifers who will be having their first calves. Let’s hope it all goes without a hitch! The calves are very cheeky and escape their mothers and gather in little gangs. When the mother’s udders get tight with milk they start moo-ing for their calves & it can get very noisy until they are reunited! The sheep that visit us in the winter to eat off our grass have mainly returned to their home farm to have their lambs. We did get a few early lambs born here. We still have some of last year’s ewe lambs here but they will also soon return home as they’ve eaten most of the grass. This spring we will be doing something different with 3 of our fields. Last year we produced more grass round bale silage than we needed (the grass grows and we must deal with it)! We have a large stock of round bale silage that will carry us into next winter. So, this year we will be growing some Spring Barley which will be harvested with a combine and give us barley and also straw (both of which we currently buy in for our beef herd). 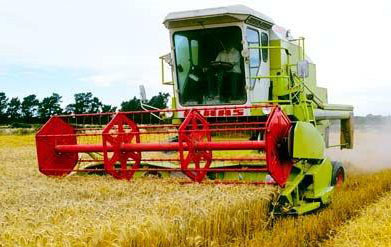 The ground will need ploughing and cultivating to get the crop to grow so we have purchased some second hand equipment to do the job. We will soon have a plough and power-harrow (to break down our heavy clay soil in readiness for the seeds). Like most industries farming is ever-changing and we need to react, doing something new to meet the demand for feed. Some of you may be here when the combine harvester is here later in the year. The ground we farm is not renowned for arable crops as its wet, but we need enough to feed out cattle and certainly won’t need more grass (which we do seem to be able to grow)! 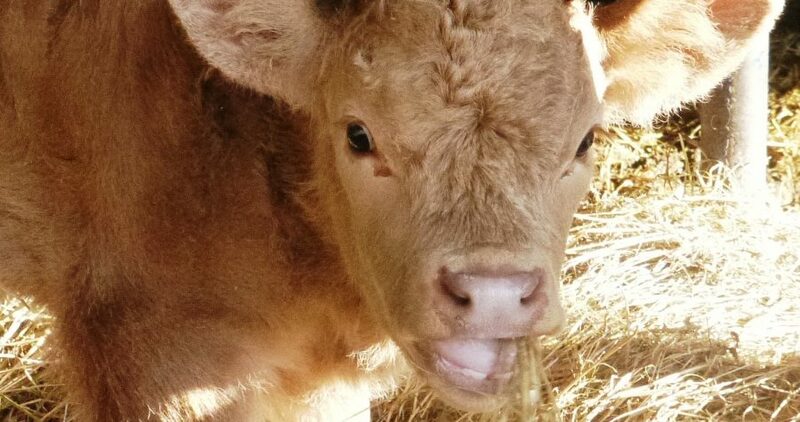 Fingers crossed for a dry time to till our barley and 8 more healthy calves and mums! Our secure CaSSOA GOLD standard caravan storage facility offers outside and undercover purpose-built storage. Set in the peaceful, beautiful north Devon countryside our family friendly and dog friendly Touring Site is open all year. Most major cards accepted. Gift vouchers are available from the Office.